The performance car drivers are anxiously waiting for the new Nissan GT-R to become available at your local Nissan dealership. This car brings super-car performance at bargain prices, but at present you will only get one through the grey import houses. The performance of the GT-R, with its 4WD is already legendary, but Nissan have not sat back there. They have now produced a “performance” version V-Spec (‘Victory Specification’) version which was spied at the Nurburgring, and Euro reports suggest the stripped-down, pumped-up GT-R stopped the clocks at a staggering 7min 25sec. Putting this in perspective, the standard GT-R’s benchmark time (albeit on a partly wet track) is quoted by Nissan at 7 min 38 seconds, which is already quicker than a Porsche 911 GT3 or 911 Turbo. However, a lap of 7.25 places the GT-R V-Spec ahead of the vaunted Pagani Zonda F Clubsport (7:27), Porsche Carrera GT (7:28), Porsche 997 GT2 (7:32) and Koenigsegg CCR (7:34). The key to the V-Spec’s pace is much the same as the recipe for the Lamborghini Gallardo Superleggera and Ferrari F430 Scuderia - less weight, more power and tweaked aerodynamics. Reports suggest kerb weight (1740 kg in standard form) has been pruned by more than 150 kg via extensive use of carbon fiber and the deletion of bits deemed non-essential. The 3.8 liter twin-turbo V6 has also reportedly been worked over to yield an additional 50 kW-plus, taking its total output to somewhere more than 400 kW. A super-car down at the dealership with a Nissan Sunny Neo. The mind boggles at the thought. Those figures should be taken with a grain of salt, however, as to be really accurate, the times should be done on the same day with the same driver. 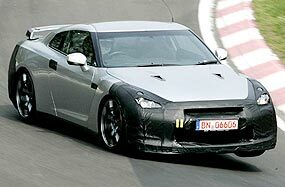 But you can see that even the cooking model GT-R is a very potent motor car. Last week I noted that one driver attempted to qualify for the 1949 Indy 500 in a car that was 35 years old. I asked what was the car? It was a 1914 Grand Prix Peugeot. So to this week. There is one automaker in the USA which has been building cars since 1896. Which is it? Crash helmets in Thailand range from laughable to ludicrous. My favorite is the blue plastic number, unlined, with plastic straps (invariably never done up) that must be made from recycled ice-cream buckets. And my other ‘must have’ helmet is the black plastic London Bobby’s headgear. Like everything in motor sport, helmets too have been modified to come up with the new skull and brain protection. Although its fundamental shape may look very similar to those worn by drivers in the 1980’s and even the 1970’s, the underlying design and construction technology has changed radically over the years. Current Formula One helmets are massively strong and considerably lighter, now weighing approximately 1.25 kg. Helmets are constructed from several separate layers, offering a combination of strength and flexibility (vital to absorb the force of large impacts). The outer shell has two layers, typically fiber-reinforced resin over carbon fiber. Under that comes a layer formed of vastly strong plastic, the same material used in many bullet-proof vests. Then there is a softer, deformable layer made from a plastic based on polystyrene, covered with the flame-proof material used in racing overalls and gloves. The visor will be made of a special clear polycarbonate, combining excellent impact protection with flame resistance and excellent visibility. Most drivers use tinted visors, the insides of which are coated with anti-fogging chemicals to prevent them misting up, particularly in wet conditions. The latest designs are more aerodynamically efficient. Sitting directly below the main engine air intake, helmets are increasingly shaped to assist in getting the air smoothly into the engine. As you would expect, the FIA have strict ‘super helmet’ requirements for Formula One racing. To gain approval for Grand Prix use, a helmet design must pass a number of tests, covering factors such as crush and penetration resistance and surface friction. It must also work correctly in conjunction with the mandatory HANS (Head and Neck Support) device. It is also very expensive! This year the overall impression is that the major Japanese and German manufacturers wanted to showcase their latest offerings in the large capacity Tourers, Sports Tourers and Muscle bikes for the Thailand market. Of the smaller capacity machines the trend back to the look of the Vespa and Lambrettas Italian scooters of the 1960s continues. Meanwhile another thread of design seeks to emulate the MotoGP look with fully faired front ends and high kick up bodywork over the rear wheel. It was good also to see the return of the Thailand manufacturer, Tiger, albeit with a more modest display, while Ducati were represented by a dealership rather than the Bologna factory itself. Not appearing were, surprisingly after last year, the T-United with their small capacity hybrid machines. Also absent were Triumph, now on sale in Bangkok and manufactured at Chonburi. Of interest is that the top of the range K1200LT would appear to have been withdrawn from the Asian market. Although technically it is still in the model line-up it is probably due for replacement. However BMW were well represented as follows. HP2 Megamoto - This is an off-road (trailie) with over 110 bhp from the flat twin engine which should give huge pulling power from the bottom of the engine speed range. The high-quality, racing-style tubular space frame is said to give extreme torsional stiffness. The 179 kg dry weight is impressive and BMW claim this bike never gets out of breath and offers incredible braking points and extreme banking at a level only offered by superbikes! K1200 GS – Enduro - Again, using the “Boxer” twin cylinder fuel injected engine, this enduro style machine has 105 bhp and 115 Nm torque at modest revs, more suited to an off-road performer than a street bike of 1200 cc capacity. 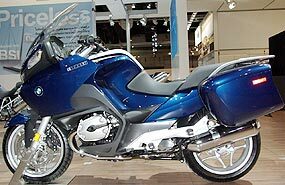 R1200 RT – Tour - The “RT” is promoted as a long distance tourer with full on board luggage and capabilities to cover thousands of kilometres. A tailor-made package of comprehensive accessories with a wide range of technical features is available for adaptation to individual owner touring needs, with ABS as standard. Two models were on display, courtesy of a local dealer. 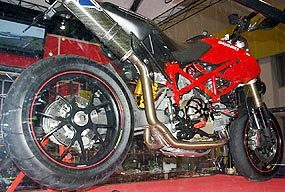 1098S - This lightweight (171 kg) bike utilizes the familiar, L-Twin cylinder, 4 valve per cylinder Desmodromic, liquid cooled engine uprated to the ‘S’ performance with 160 BHP produced at 9750 rpm. The new 1098 S has achieved the status of the highest performance Ducati street bike ever by reducing weight to the minimum and adding world-class components to an already excellent design. Suspension is of the very highest performance standard. The forks are fully adjustable Ohlins units, 43 mm at the front and a single unit at the rear mounted to a single-sided swing arm. The Ohlins package is completed with an adjustable steering damper. This package does not come cheap, retailing at 14,000 pounds sterling or about 1 million baht before import! Monster - Powered by the smaller 992 cc air-cooled version of the desmodromic engine giving 95 BHP at 8000 rpm the Monster is more typically a naked sports tourer. The performance will test the endurance of the rider on this high speed machine without significant wind protection.